I watched a very interesting video today on soil biology from growuniversity.net. If you haven't schedule yourself to attend one of the growuniversity.net webinars do so. They are very well done. After watch the video I went out and gave both plants some aerated compost tea that I had been brewing for 36 hours. The plants should like that. This evening I gave the 282 Scherber plant some TKO. That should help the plant push the pumpkin along. It is 11 days old now and growing fairly well. 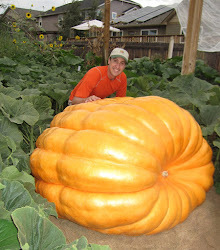 It had the same day 10 measurement as my big pumpkin had two years ago. Doesn't mean anything, but you would rather have it bigger than small. The unfortunate thing with this pumpkin is that it will just be starting to pack on the pounds when we go into September. Colorado's Septembers can have very sketchy weather. Typically not snow, but cool fall like weather will slow the pumpkin down when it is really starting to grow. 1985 pumpkin is having problems and I'm not sure why. Growth has fallen off. No signs of disease yet and the vines are still growing well, but not seeing the kind of giant pumpkin growth that I would have expected from this plant. Do you sell TKO or can you point me the way? And what is a good ten day measurement? You can buy TKO online. I'm not aware of any stores that carry it. Last I knew it was only sold in big containers for agricultural use. As far as 10 day growth, it completely depends on what stage your pumpkin is at. I'm not at home right now but there is a pumpkin pacer chart that charts average growth for 1,200 pound pumpkins. I think you can download it from the fox website.